No one saw Dow 15,000+ coming in this time frame, not the bears, nor the bulls (me included). This is why stock market investing, any market investing at it's core is not about market forecasts as I tried to explain in my latest ebook Stocks Stealth Bull Market Update 2013 (FREE DOWNLOAD) that profitable investing at it's very core is money and risk management and everything else only tends to make a marginal difference to ones portfolio over the long-run if money and risk management strategies are properly employed. The problem with most people who invest is that they are focused on the utterances of those in the mainstream financial media and the financial sales industry which basically comprises those that Obviously DO NOT TRADE or Invest! Instead in reality they are neither perma bulls nor perma bears but perma BS sales persons. I did not see Dow 15,105 coming in this time frame. Instead I had engineered my portfolio by mid March down to about 18% net Long in anticipation for a probable correction of a good 12% or so from Mid March to Mid August to accumulate into, Instead the market as of writing has since risen by a good 5%. The key to successful investing is not to lose money when one is wrong, and that can only be achieved through understanding the underlying forces at work which have remained constant for the duration of the stocks stealth bull market of the past 5 years, and that constant is one of stocks being leveraged to money and debt printing inflation consequences. 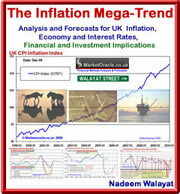 Whilst the mainstream media will be pointing to an improving U.S. economy as an explanation, I will instead reiterate the real reason that I have repeatedly stated for at least the past 4 years is that asset prices tend to be leveraged to inflation with sentiment driven prices oscillating around the inflation mega-trend (which is exponential) between extremes of over bought and over sold states. And there is nothing, NOTHING to suggest that this fundamental structure of our economic and financial universe is about to change any time soon. Instead everything points to far more inflation during the next 5 years then we have witnessed during the past 5 years as illustrated by the following graphs. Whilst I am getting a number of requests for detailed analysis of the stock market, I have to remind readers that the stocks bull market is a 5 year old trend. Instead my focus for a near year has been on the NEXT trend - The HOUSING Markets, which is where I have been shifting most of my wealth into. To get my next in-depth analysis in your email in box, ensure you are subscribed to my ALWAYS FREE newsletter. Thank you very much for this quick and much appreciated update. "I have to remind readers that the stocks bull market is a 5 year old trend." P.S. That last line of mine comes from the movie Margin Call. I just had to borrow it. It's just that I don't expect a 5 year old bull market to deliver similar gains going forward i.e. the last 5 years have seen an average gain of about 25% per year, whereas I expect the next five years will probably be lucky to average out at 8% per year. Thank you for your increadible insights on the Stock markets. I have the same view regarding the stock market but my patience is running out!!! As you have admitted the Dow has moved much higher than expected, are you still expecting the masive correction as per your latest ebook, Stealth Bull Market beyond 2013? If so at what level? Furthermore you are now postioning to invest 60% of your portfolio in the property market. Any thoughts on how one could invest inorder to hedge against inflation through property but does not have access to physical property? I like to buy when stocks are cheap and sell when they are being bid up in a frenzy like now. With regards housing, it all boils down to risk vs reward. it has to be physical property, for very low risk and high potential returns, housing stocks may give higher returns but the risk vs reward is nowhere near as good. My current article is on UK housing, I should have posted it a week ago but it's way too long and I need to cut it down further before posting, else people will complain that it is well... too long.